Engaged learning at Michigan is steeped in a tradition of excellence and brimming with creative new ways to share knowledge, address issues of the day, and equip future leaders with the skills and confidence they need to solve some of society’s most vexing challenges. Engaged learning offers students opportunities to practice in unscripted, authentic settings, where stakeholders (including the students themselves) are invested in the outcome. The University of Michigan community has developed five engaged learning goals, identified key practices that promote this kind of unscripted education, as well as invested deeply in developing a culture of engaged learning on campus through the Transforming Learning for a Third Century Initiative. Engaged learning is high-impact and experiential learning. It happens in environments where students from multiple disciplines collaborate on real-world, ambiguous and unscripted challenges. 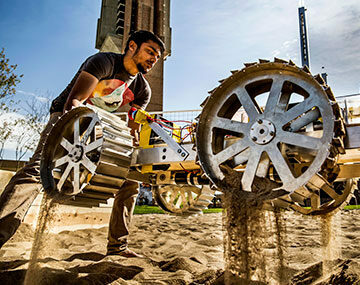 From courses to projects to student groups, there are numerous opportunities to engage at U-M. Faculty interested in incorporating engaged learning techniques into their curriculum can access a wide variety of tools and resources at U-M.
U-M graduate student Ashley Lemke and paleontologists Joe El Adli and Daniel Fisher examine a stone flake found near the animal's tusks during the excavation. The flake may be a tool that ancient people used to cut the mammoth.